As we all know, data center cabling system consists of multiple devices, such as fiber optic transceiver, fiber optic patch cable, fiber patch panel, cable manager, and so on. As the central nerve of the whole cabling system, gigabit switch has been a topic of discussion. To satisfy different sizes of networking deployment, there are various types of Ethernet switches. This article will introduce a kind of 48 port gigabit SFP switch. FS.COM S5800-48F4S switch is a 48 port gigabit switch with 10gb uplink. It has 48×1GbE SFP ports and 4×10GbE SFP+ ports in a compact 1RU form factor. The switching capacity of this 48 port switch is 176 Gbps and its non-blocking bandwidth is 88 Gbps. And this gigabit switch can provide 130.95 Mpps. Meanwhile, FS.COM S5800-48F4S switch has 2 (1+1 redundancy) hot-swap power supplies and 4 (N+1 redundancy) hot-swappable fans. It is also a low latency L2/L3 Ethernet switch with 2.3us latency. The price of this 48 port gigabit switch with 10gb uplink is US$ 1,699.00. 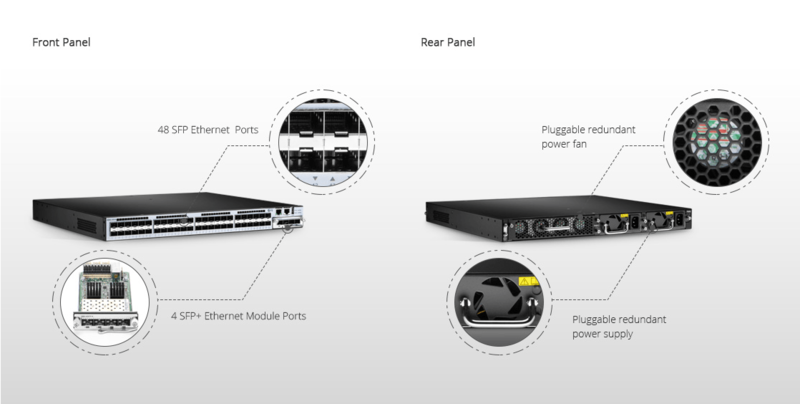 Here is a figure for you which shows front and back panel overview of FS.COM S5800-48F4S 48 port gigabit SFP switch. The S5800-48F4S 48 port gigabit SFP switch with 10GE SFP+ uplinks comes with the complete system software with comprehensive protocols and applications to facilitate the rapid service deployment and management for both traditional L2/L3/MPLS networks. With support for advanced features, including MLAG, SFLOW, SNMP etc, this switch is ideal for traditional or fully virtualized data center. The S5800-48F4S hardware also provides high-availability features, including pluggable redundant fans and using high quality electronic components, which ensures low power consumption. Designed with 48×1GbE SFP ports and 4×10GbE SFP+ ports, FS.COM S5800-48F4S 48 port gigabit SFP switch can accomplish N×1G to N×1G (N≤48) connection or N×10G to N×10G (N≤4) connection. For example, in 5G to 5G connection, on one side, five 1G SFP transceivers are plugged into SFP ports on S5800-48F4S switch; on the other side, another five 1G SFP transceiver modules are plugged into SFP ports on switch, too. Then, these five SFP optical transceivers are connected by five fiber optic cables. It should be noted that the transceivers and fiber patch cables used in the link are of the same type. In the above part, we mention that the S5800-48F4S 48 port gigabit SFP switch can be used with SFP transceiver, SFP+ module and fiber optic cable. This part will go on introducing some support accessories for this 48 port gigabit SFP switch. As the size of data center becomes larger and larger, cable density increases, too. To simplify the cabling, many data center managers prefer network switch with high density ports. The above 48 port gigabit SFP switch with 10GE SFP+ uplinks is a suitable choice for high density cabling. Network switch, a box-shaped device, plays an important role in a network deployment. To achieve high network performance, a suitable switch is required. There are smart managed switch and unmanaged switch on the market. How much do you know about them? Smart managed switch vs. unmanaged switch, which one should you choose for your network deployment? Keep reading, and you will find the answer. If you look through the official website of several vendors, you may find that some offer smart switch, the others provide managed switch. Smart switch vs. managed switch, what’s the different between them? Smart switch has some features that managed switch has, but are more limited. Besides, smart switch is cheaper than managed switch. So, it’s a cost-effective alternative to managed switch. In fact, “smart switch” and “managed switch” are terms invented by vendors. And the exact meaning may vary from vendor to vendor. To some extent, smart switch and managed switch are virtually the same. In the following part, I combine them as smart managed switch for easy reading. As smart managed switch and unmanaged switch have different features, they are used in different applications. Smart managed switch offers features like QoS (Quality of Service), Simple Network Management Protocol (SNMP), command line interface (CLI), Rapid Spanning Tree Protocol (RSTP), redundancy capability, VLANs, LACP and so on. The greatest advantage of smart managed switch is that you can change the configuration of the switch to satisfy your specific networking needs. Smart managed switch is especially suitable for enterprises that need to manage and troubleshoot their network remotely and securely, allowing network managers to monitor and control the traffic to achieve optimal network performance and reliability. 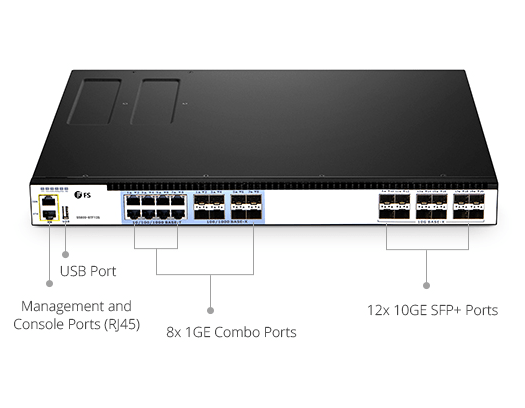 The following figure shows FS S5800-8TF12S smart managed switch which provides high port density with 8-port 1GbE RJ45 and 8-port 1GbE SFP combo and 12-port 10GbE uplink in a compact 1RU form factor. Unmanaged switch is basic plug-and-play switch with no remote configuration, management, or monitoring options. It allows Ethernet devices to communicate with one another (such as a PC or network printer) by providing a connection to the network and passing on information to where it needs to go. Therefore, unmanaged switch is usually used to extend the number of Ethernet ports. Unmanaged switch can be desktop or rack mounted. It is less expensive than smart managed switch and is suitable for home use, SOHO and small businesses. From the above content, we can conclude that smart managed switch vs. unmanaged switch, the biggest difference between them is the configuration feature. As for which one to choose, it really depends on your need. If you just want to set up a home network or add more Ethernet ports, unmanaged switch is good enough. If you need configuration options like VLAN and QoS, you will have to use smart managed switch. If your laptop has built-in fan, you must have gone through such experience: when your laptop has been working for a long time, it will be heating. Then, you may start the fan to cool your laptop down. However, there will be noise. So does network switch. Compared with other optical components, network switch is larger. And ongoing work will cause overheating. Therefore, many network switches are designed with fans and very noisy. Is there any solution that is the best of both worlds? The answer is “Yes”. Fanless switch can do this. This article will guide you have a closer look at fanless switch. Taken literally, fanless switch does not have any fans built into it, thus it has a quiet operation. But how is it cooled down? In fact, engineers employ passive cooling system for fanless switch to transfer heat. The passive cooling system achieves high levels of natural convection and heat dissipation by utilizing a heat spreader or a heat sink to maximize the radiation and convection heat transfer modes. Therefore, it can provide energy efficiency and lower financial cost. With passive cooling system, fanless switch is a cost-effective and energy-efficient solution that maintains optimal operating temperature without causing much noise. While fan switch utilizes active cooling system which refers to cooling technologies that rely on an external device to enhance heat transfer. Through active cooling system, the rate of fluid flow increases during convection, which dramatically increases the rate of heat removal. Apart from the unpleasant noise, the main disadvantage of active cooling system is that it requires larger power consumption and costs more than passive cooling system. FS 8-port Gigabit PoE fanless switch is designed with 8x 10/100/1000BASE-T RJ45 Ethernet ports, 1x console port, and 2x gigabit SFP slots. It has Layer2+ switching features and the switching capacity is 20Gbps. This 8-port fanless switch also support PoE function. It can supply power to network equipment such as weather-proof IP cameras with windshield wiper and heater, high-performance access point and IP telephone. The max power consumption of this managed PoE switch is 130W. In addition, this fanless switch has Mini body. Whether it is in the data room, office, or installed to other places, it can save you more space and make networking more convenient. To accomplish the link, you can use 100BASE SFP, 1000BASE SFP, BIDI SFP, CWDM SFP, DWDM SFP optical transceiver or 1000BASE-T SFP copper RJ-45 transceiver. FS.COM provides many high-quality compatible SFP modules for 8-port fanless switch. Here is a figure of FS 8-port Gigabit fanless switch for you. Network switch has become an integral part of optical link, serving as the central system. But the noise is the main problem that many data center managers are faced with. To overcome this, silent fanless switch has already been available on the market. At FS.COM, small and medium-sized business can find reliable and affordable fanless switches. Like the above fanless switch, it is US $159.00. These switches are designed with high resistance to electromagnetic interference. They also features superior performance in stability, environmental adaptability. What’s more, FS.COM provides service like a one-year limited warranty, including any quality problems during the free maintenance. Besides, there are cheap and quality optical transceivers at FS.COM. And all of them are tested for 100% functionality and guaranteed compatible for outstanding network performance.